All of us here at Sound Oasis are grateful you joined us this past month. Over the past few weeks have taken a closer look at Tinnitus; we covered the symptoms, types, and causes. This final week in the Tinnitus Awareness series, Sound Oasis will be covering diagnosing and treating tinnitus. Though we will be discussing how to diagnosis tinnitus we must remember that tinnitus is a symptom in itself and the diagnosis may be of the underlying condition. Tinnitus is diagnosed by your physician and can include several tests. First your doctor will do an exam of your ears, head, and neck. Another test that may be performed can include an audiological or hearing test where you listen for sounds through headphones and indicate which ear you hear the sound in. Your physician may also ask you to move your eyes from side to side, clench your jaw, or move your neck, arms and legs to determine if there is movement disorder such as vertigo causing the tinnitus. CT scans and MRI’s may also be ordered to determine if your tinnitus is caused by a blood vessel disorder or an acoustic neuroma. The type of sound that you hear can also help determine the cause of your tinnitus, for example a rushing or humming sound is usually vascular in nature. If you continuously hear your heart beat you may suffer from high blood pressure, an aneurysm, tumor, or a blockage in the ear canal. Your physician may refer you to an ENT or audiologist for some of the testing to be performed. Even with all of the testing a cause may not be found. There is no medical or surgical cure for tinnitus. To treat it you must treat the underlying condition. For patients who suffer from hearing loss, tinnitus hearing aids and cochlear implants may help reduce symptoms. Most patients get relief from their symptoms with therapy and masking. 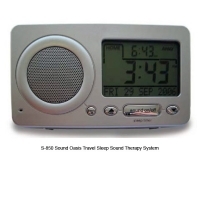 Masking tinnitus involves using a sound generator to drown out the sounds of the tinnitus. There are several types of devices that can be used for this treatment. There are machines that are worn like hearing aids, table top, and mp3 style with headphones. Our favorites are this one, the BST-100 and the S-850W for when we are out and about. All of us here at Sound Oasis would like to thank you for joining us this month in raising awareness for tinnitus. We hope you learned about the symptoms, types, causes, and diagnosis and treatment of this sometimes debilitating condition. Don’t forget to come back next month to see what’s going on. Let us know if you have any questions or comments below. Until next time!